Gustave Dupont founded his car company in 1900 near Paris, in a commune of which he was the mayor. Dupont himself drove his cars in competitive events and rallies, never doing well, but always finishing. Liberias were on display at 1901 Paris Motor Show, but the company was bankrupt before the end of 1902. All Liberia automobiles used one of two Aster engines. This car uses the larger, 12 horsepower Aster twin-cylinder unit. The body was built by the little-known Carrosserie L. Barjou. The catalog calls this a c.1902 Dupont-Liberia, but reference materials list it simply as “Liberia,” with Dupont being the man behind the curtain, as it were. This example is one of two known examples of the marque to still exist, and as you can see it is in a condition that certainly looks original, even though it may have been repainted at some point in the past and wears replacement tires. As a rare survivor, it should bring between $160,000-$180,000. Click here for more info and here for more from this sale. 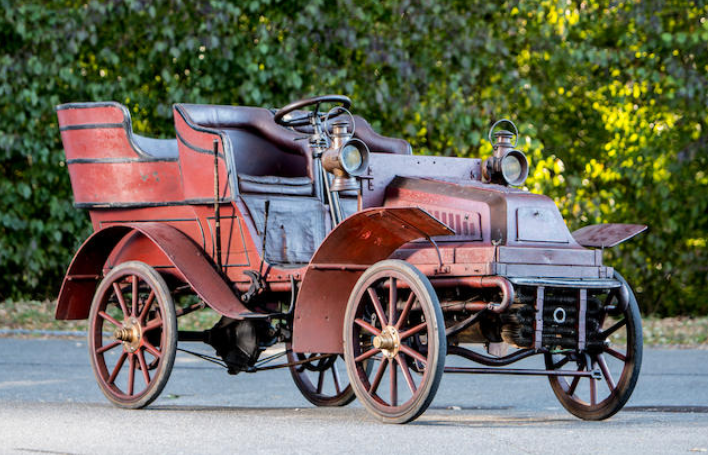 This entry was posted in Uncategorized and tagged 12hp, 1902, 2/4-seater, auctions, Bonhams, cars, classic cars, detachable tonneau, liberia, twin cylinder by classiccarweekly. Bookmark the permalink.